Woo, SpaceX can launch a car to Mars! I’d love to see what happens to the Roadster after a few years in that orbit. *Something about 99% chance of not hitting Mars initially and a 95% chance of not hitting it after 50 years. It’s a concern about contaminating the planet. So SpaceX would have to sanitize the entire car - which would be a significant waste of resources. The car is just taking the place of a test mass for the launch. EDIT: Launch delayed two hours to 3:05 eastern time. EDIT: Launched delayed another 40 minutes to 3:45 eastern time. So glad it got delayed, woke up just in time to catch it live. The world's most powerful rocket successfully lifts clear of its pad on historic maiden flight. After the launch we were discussing this in our lab. Despite the fact were 2 months early for the optimal window it’s ‘only’ about 500-1000 ish m/s more launching now according to pork chop plots. Thats a substantial amount but with a small enough payload that different can be negligible. That launch was gorgeous though and so cool to watch. Stage separation was so much more aggressive than I expected and the synchronous landing was great. First display of rockets flying in formation too! If they can do this now, then it can’t be too long until Elon sends the empty crew capsule on a return trip to Mars orbit and back again. As a round trip test. I hope they place a dummy crew or two in the capsule and have lots of HD cameras and hot microphones so we can listen in on all the sounds throughout the flight. Like the Blue Origin video with the live mic, but this time 24/7 for the whole flight mission, with views out of the crew window. Given that the payload was not significant compared to potential payload, and even with the less-than-optimal geosynchronous burn prior to the Mars departure, would this launch be capable of that? I don’t expect them to change it, given the lack of sterilization of the payload, but it would be pretty cool to park it in a Mars orbit forever. Edit: being the geo statement from the Scott Manley video, but he also said the two side boosters would have ~15 second delay, so…accuracy unclear. Also, a little disappointing that the center booster failed, but a minor hiccup overall. FH will not be manrated. In the post launch interview he said BFR should be coming online soon enough anyways that it’s not necessary. The payload mass decreases the farther in the solar system you want to send it. Yeah it’s possible to get it out to Mars. If they wanted to fly by they only had to wait 2 months. Hell, they could have done it now if they had the precision. The hard part is manufacturing a spacecraft that can last many months or more in interplanetary space. It’s a lot harder than using your second stage to put you on a ballistic trajectory. The Falcon second stage has just had it’s longest operational life time in space ever at 6 hours, which was one of the mission objectives for this launch because it’s necessary for direct GEO insertions. I like the subwoofer idea, to really capture the sound. I hope the party went well, what with delays and such. I was thinking about the subwoofer idea as all those enthusiastic idiots were drowning out every element of interesting audio during the launch. 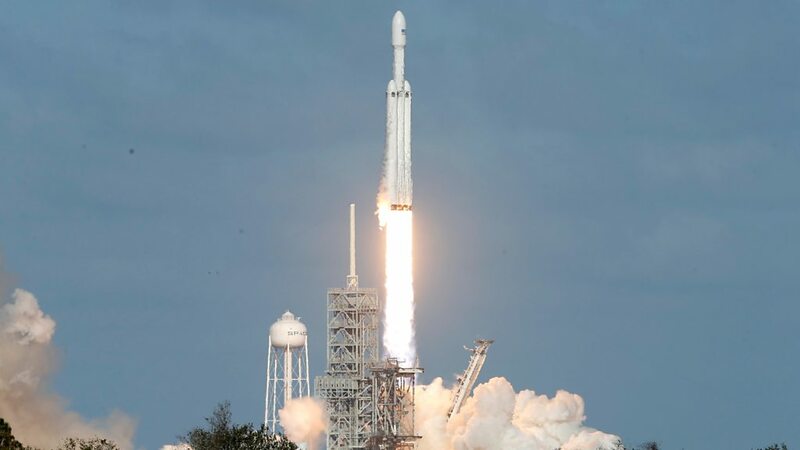 I know that SpaceX tries to convey a sense of excitement over their launches, but the level of noise really detracted from enjoying that amazing experience. If anyone finds a recording without the screaming, please link it here. They overshot Mars and the Tesla will be headed out towards the asteroids. Apparently people are champing at the bit to find out what the new orbit will be so they can perform a risk assessment on other bodies. The overshoot is disappointing. The rocket was built from block 3 and block 4 parts, so they’re not going to reuse either of the landed cores. Only block 5 components are to be used multiple times and there are no plans for development of a block 6. The BFR is the focus of work beyond block 5. One last mention is that I was wondering what they were going to do with the massive crossbars that secure the three cores together. Any other organization would just eject them. Not SpaceX. They rotated those babies up and stowed them against the center core. It’s stuff like that that warms my heart. Congratulations to the entire SpaceX team. I know that SpaceX tries to convey a sense of excitement over their launches, but the level of noise really detracted from enjoying that amazing experience. I’m surprised they haven’t put up the Technical broadcast like with other launches. Those are nice to watch with just the rocket and mission control. Haven’t seen a technical webcast for launches for quite some while now … kind of looks like they faded it out silently a while ago. They did it. WOOOOOOOOOOOOOO. It didn’t explode. Nice. Rewatching this evening this time with fixed cameras. This video has all the fixes to the views. Quite the event, I enjoyed the Bowie playing during the fairing deployment. I was curious about the landing if they going to risk landing the boosters together or with some slight delay to minimize the risk of bumps and such. I was thoroughly impressed by the synchronization of the two side boosters - until I realized that it was the same video feed twice. Somebody at SpaceX goofed, and it fooled a lot of people. Matt’s video has both booster feeds, and the video again makes sense. They have great automatic flight control, but not the perfection suggested by the live video. Here’s another interesting take on the launch from the guy who does Smarter Every Day. He’s standing on the VAB, so there’s a definite delay in the audio, but it’s free of all that cheering. Also, he focuses on the sound of the launch - which I brought up - and you also get a little bit of the sensation of the rocket going from the ground all the way into space. I wish he’d thought to try to convey that sensation a bit more clearly. As a bonus, he documents the triple sonic boom that comes off each booster as it returns to the pad area. Its very clear, so I think you’ll enjoy it. It went so much better than I expected! I wasn’t able to get my hands on any big speakers in time, but I don’t think that would have mattered all that much given the audience. Nobody there had seen previous launches (or the live launch earlier that afternoon) so they really didn’t know what to expect. We watched the full broadcast starting at T-22 minutes, with full commentary for context, and the sounds of the SpaceX team cheering in the background. Follow that up with video of Starman floating out above the earth… A evening of win all round. I will be hosting more private Launch parties in the future, everyone loved it, and quite a few people were asking for links to the YouTube channel, asked questions about other companies, what SpaceX was doing all this for, etc. I guess they updated the video again, im not sure what changed but there’s a new url. I meant to respond to this because I think I know the reason. Typically for cold gas thrusters you have a minimum impulse possible based on the minimum time you can actuate the valving. If you wanted to thrust below this minimum impulse based on accuracy you would actuate multiple thrusters(basically valves in the case of cold gas thrusters) to offset. Say you wanted .5 units to the right but you were only capable of thrusting in units of 1 at minimum. You could thrust 1.5 to the right and 1 to the left to get the accurate .5 net in the right direction. It obviously uses more fuel than just thrusting .5 to the right but we couldn’t in the first place because we don’t have the control authority to make that work. I can’t see where 30:30 was in the main video to see the reference though because of the new video so I’m not sure if that’s the case or they were just venting after the fact. 30:30 in this video is them just venting the gas afterwards. Pressurized fuel is dangerous. @Mattk50 They fixed the dual video during landing. Before they had the same camera from the view on the left as the right. They must have reuploaded with the correct second booster video pasted on the right view.